For days now I’ve been wanting to post a picture of a quilt I finished at the Gibbon retreat last weekend for my dearest and most beloved of friends, Nancy. But she reads my blog so I couldn’t give it away! Well, I just got a phone call from Nancy that FedEx had delivered her package and she got it opened after finishing a rush and now she’s all verklempt over realizing it was made just because I love her and she’s such a spectacular person. So here’s the picture. I’m sorry it took so long girl! Hopefully, the matching pillow shams won’t take as long as the quilt did. Hey, it’s only about two years overdue! When your friends cry tears of happiness, you know you did good. Update: Credit must be paid. 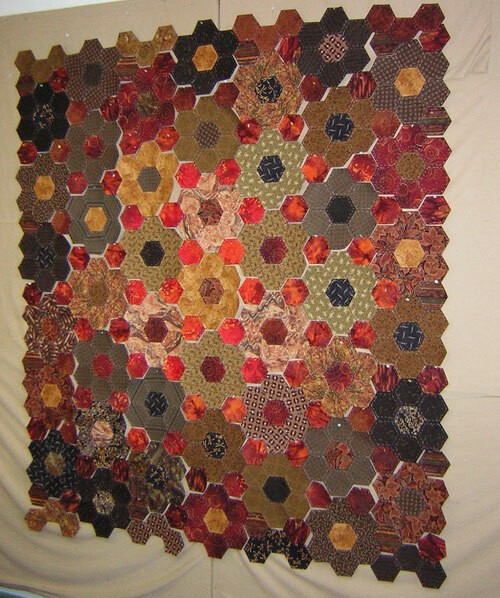 The quilting in this quilt was done by another dear friend and spectacular soul, Maxine Rosenthal, she of One-Block Wonders fame and soon to be famous for so much more. Of course, she’s already a legend in my mind! I can’t even begin to tell you all what a good time I had and how much I enjoyed myself this past weekend! 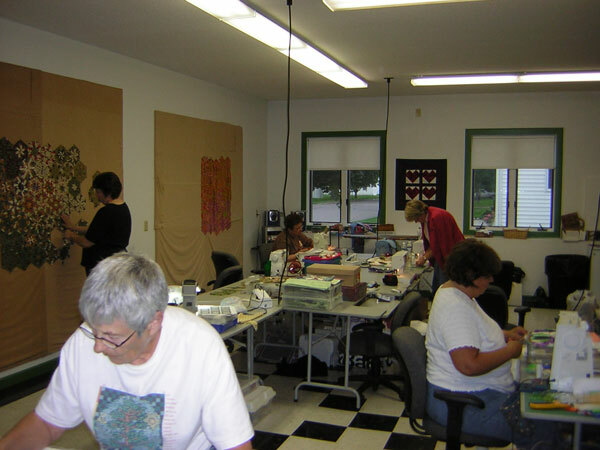 It was annual trek to Gibbon, Minnesota and Gallagher’s Retreat Center for my local quilt guild – we call ourselves Frayed Edges. 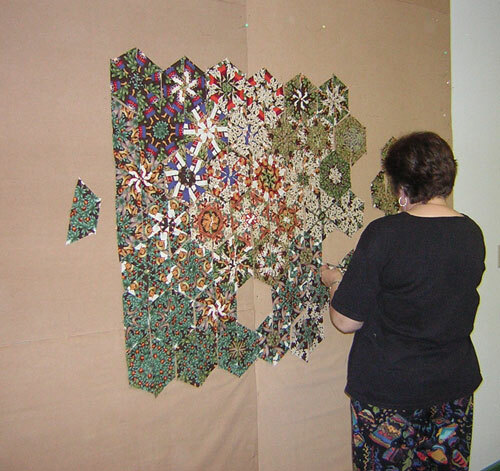 It was so nice to reconnect with my quilting buddies by spending time with them. I got more sewing done that I’ve probably gotten done in the past 2-3 years, and even after I got home last night and unpacked I sat down to sew a little more. At the retreat I finally got finished one quilt that I’ve been working on a while. I got a top put together and the borders on for a “friendship quilt” that various quilt guild buddies had made for me. And I got H’s 40th birthday quilt (note: He turns 45 in May) finally laid out on the design wall, arranged pleasingly, and the pieces all numbered for assembly so I don’t have to have the whole thing up on the wall anymore. I even got the top two feet or so of his quilt top pieced. H came in the sewing room and suggested we do some things to liven it up and make it a more enjoyable room in the house. I think he’s got the right idea! I also went to the Bird Island quilt store and bought some kits of quilts I want to make. I’m definitely taking four days next summer to go again. 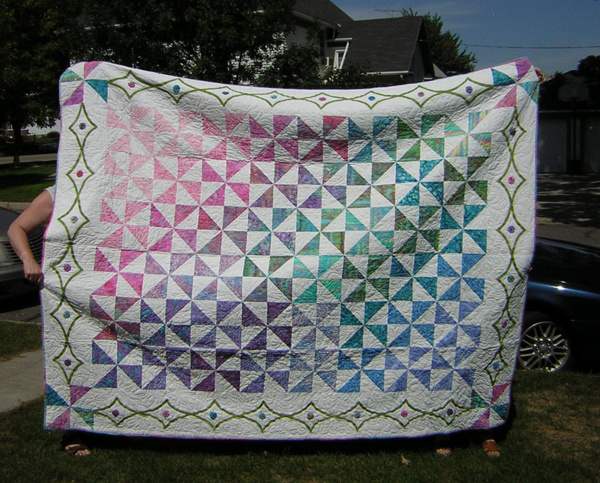 I’ve decided if I have only one quilt-related trip a year, it’s going to be to go on retreat with this guild. 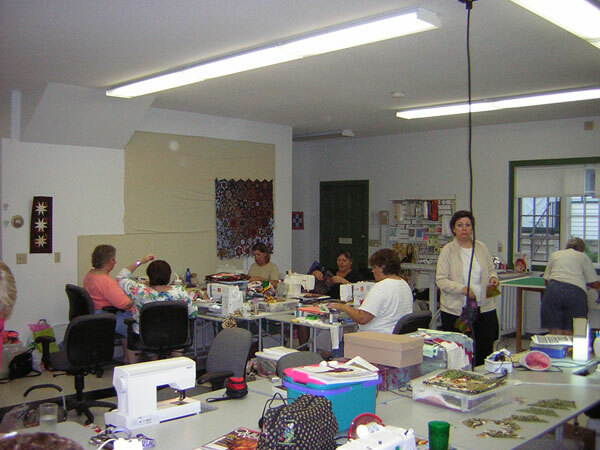 They are all my closest quilting friends and I enjoy their company so much. Every time I go to Gibbon I swear I’m going to buy myself one of those steam generator irons they have there because it makes everything so easy to press. I can’t believe it, but I did it this time. I bought myself one of those Rowenta steam generator irons. My friend Phyllis mentioned a Rowenta professional model she likes, but that was over $100 just for an ordinary iron. And Allbrands.com had a brand new Rowenta DG-980 (the one with the removable water tank) for the right price so I bought it. Good lord this turned out to be an expensive weekend. Thinking about all those cotton shirts I can iron more easily for the two of us makes me regret it a little less. On the other hand, I have to remind myself that I haven’t bought fabric in well over a year, so splurging a little this one time isn’t quite so bad (how’s that for rationalization, eh?) . I suppose if you don’t spend hours and hours pressing fabric like most of us do you would not understand why we make such a big deal over our irons. Even the very best home iron model usually isn’t strong enough to keep up with a serious quilter. I can burn through an iron in less than a year when I’m sewing a lot. And I usually buy very good quality ones. This iron will hold quite a lot of water and give 1.5 hours of uninterrupted, pressurized steam. You should see how perfectly flat your blocks come out when you press them in Gibbon! Hopefully my iron will arrive soon. The best part of the weekend is the uninterrupted sewing/working time. No one had to worry about food (the B&B owner caters it), or laundry, or phones, or kids, or pets, or partners or *anything*. All we had to do was sew and eat every now and then. Total creative isolation – it was heaven! Most people were up and sewing in the work room by 9:00 am and except for breaks for lunch and dinner, people would still be sewing well past 11:00 at night. One night, most people didn’t get to bed until 2:00 A.M.! I made it to bed every night by 10:30 or so, but some of those women are like machines! I got to stay in the front bedroom this time. I’ve haven’t stayed in that room before. It was lovely and quiet and cheerful all done up in yellows and blues and I slept so good both nights. Not to mention what a lovely drive through the country I make to get to this place. You go through farm fields and quaint little towns. On the way home, I went down one farmer’s road to the house, following the signs for freshly harvested vegetables and came home with everything to make ratatouille last night, which we ate for dinner. All in all, it was just about the perfect weekend I would say! Harald’s quilt up on the design wall. The working room behind the house at Gallagher’s Retreat. Five of us from Frayed Edges who were present at this retreat. 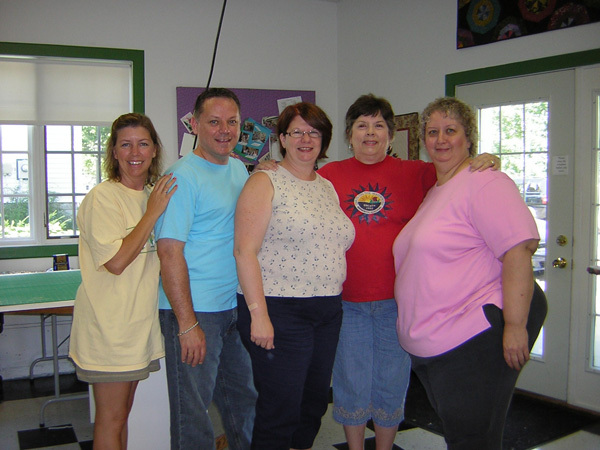 From left to right we are, Susan, Boyd, Phyllis, Joan and Kathy. Harald just call to tell me that he would be out of town over the second weekend in November. OK, I wondered, what for? He just got a call that he an another teacher had been accepted as presenters at the bi-annual Minnesota Reading Association in Duluth. So my sweetie will be up on the North Shore, sharing what he knows to a group of earnest listeners. As he progresses in his doctoral program, these conference presentations are important. I can’t begin to tell you how proud I am of him. I always knew he was star material, and now he will get to show that to others, too! I know I have been terribly tardy about posting pics of our new puppy. She grows up so much each week and she’s now more than twice as big as when we picked her up in June. 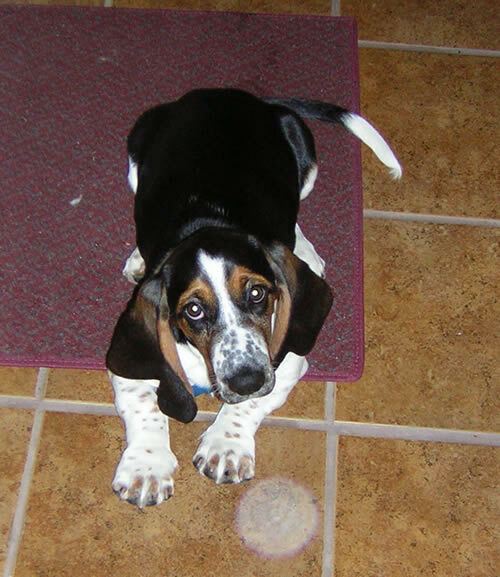 So all you puppy lovers out there, here are some more Beulah pictures taken recently. Looking perfectly adorable and nothing but loveable. 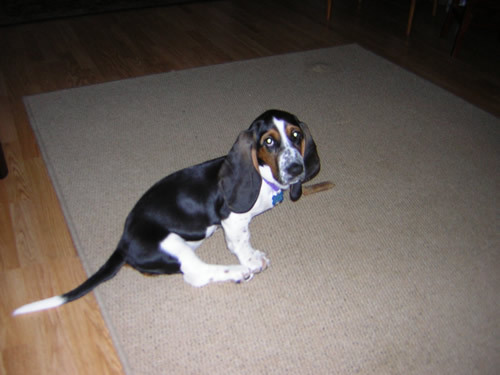 She rarely stops moving long enough to get a good shot, but she must have been tired when this picture was taken! 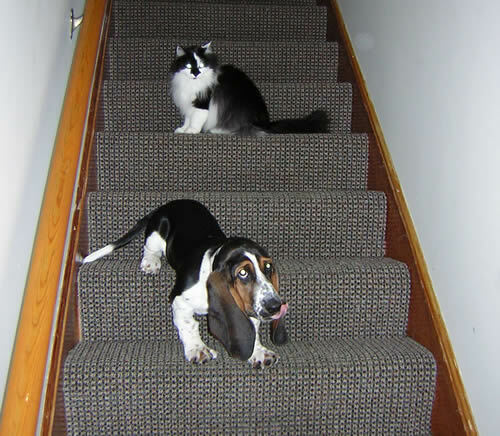 Beulah trying to figure out whether going down the steps is as much of an option as going up the steps, and Cleo sitting a few steps above her – because she likes to tease Beulah into chasing her around the house, especially if Beulah isn’t paying any attention to her.